It won’t be long now until the blessing of summer break will be upon us. While the summer brings all kinds of fun for so many kiddos out on break, it also can be a source of boredom. But never fear, with help from my good friends at Astrobrights Papers, I have just the thing for that. Without the daily demands and routines of school, not only do students lose about 2 months of learning (National Summer Learning Association), but quite honestly, they just get BORED!!! 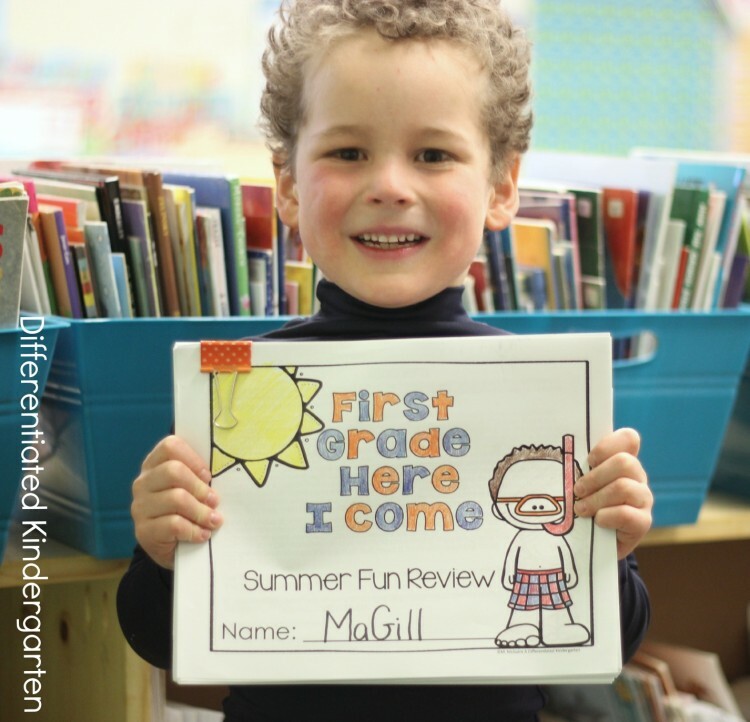 I personally always send my students home with a Summer First Grade Here I Come packet that they can use throughout the summer to keep their skills sharp. It specifically covers all those skills that they needed to master in kindergarten in order to start the year out successful in first grade. 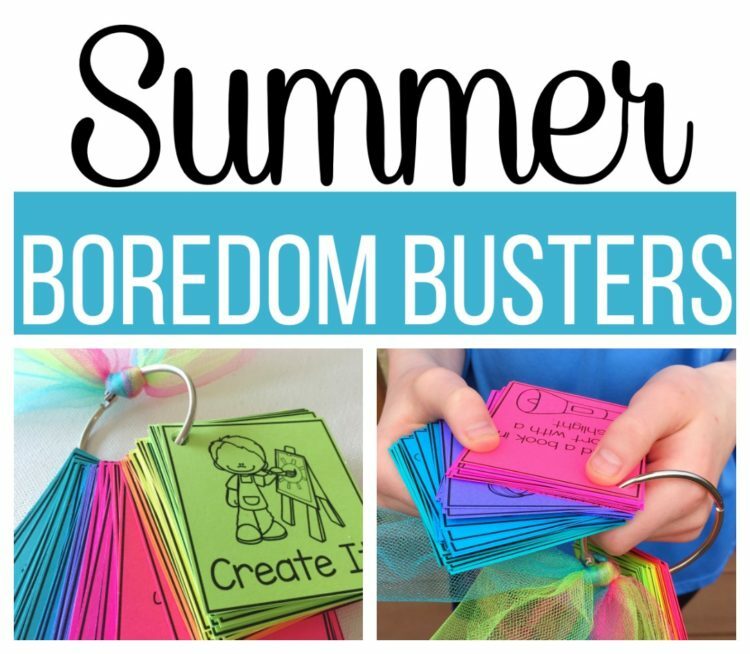 But for those day to day stints of boredom, when they can’t think of an activity to do and they are simply ‘under foot,’ I created a Summer Boredom Busters ring of activities for my students to give to their parents! A gift for parents? Of course! Why not? I’m sure they’ll be incredibly grateful to have ideas and activities to keep their little ones busy during summer days when they just can’t find anything to do. 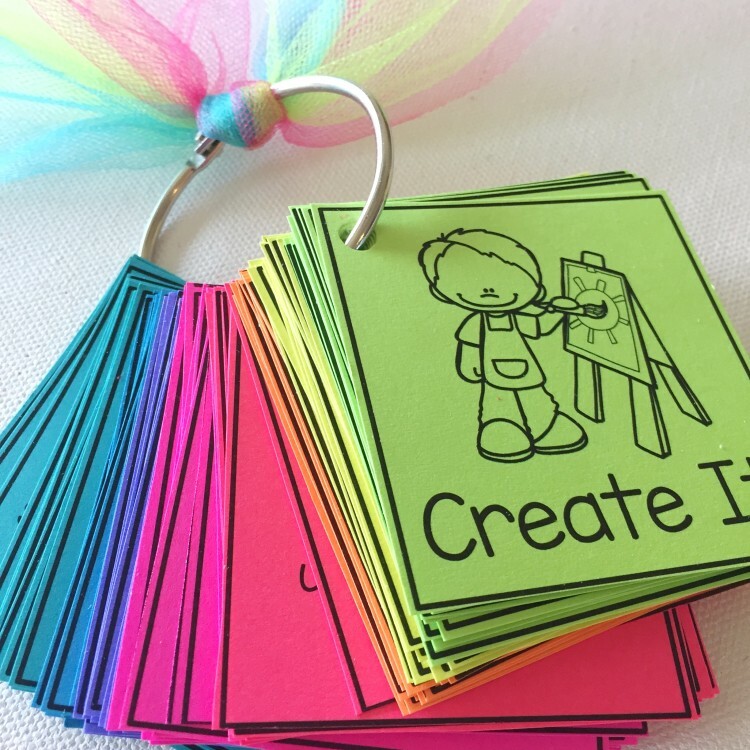 In this free packet, I created eight categories of activities. 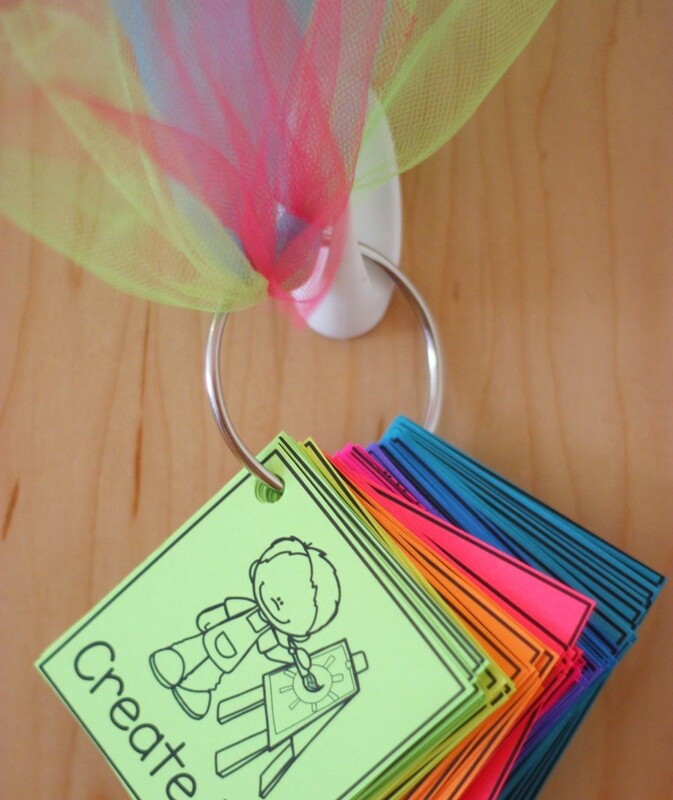 There are Creative, Math, Reading, Word Work, Movement, Exploring, Build and Just For Fun categories. While they have a bit of an educational twist to them . . . 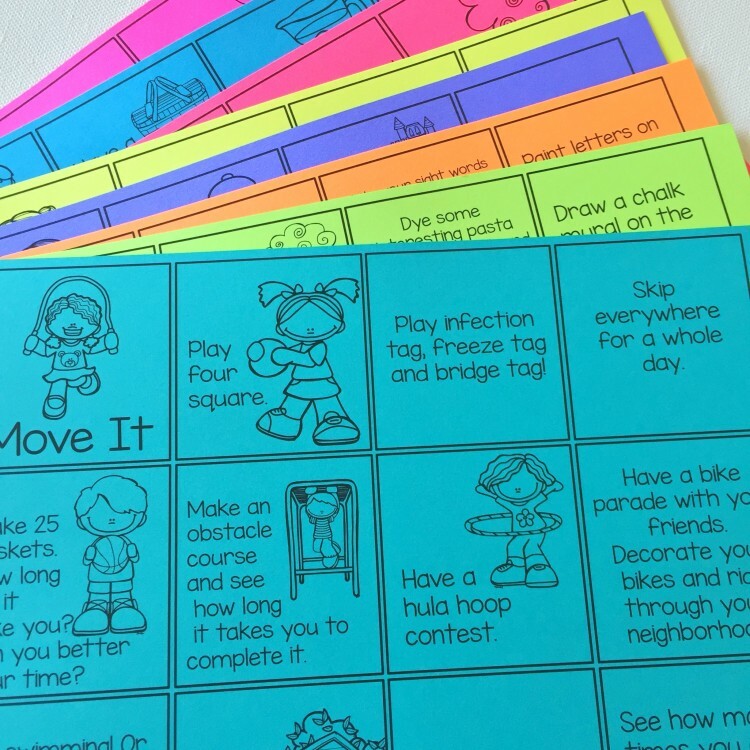 I wanted the activities to be fun and engaging so that students wouldn’t necessarily think of them as summer ‘homework.’ I mean, they certainly aren’t pencil/paper type activities. These are some of my favorite classroom activities but even more activities that I’ve used with my own boys throughout their summer breaks. 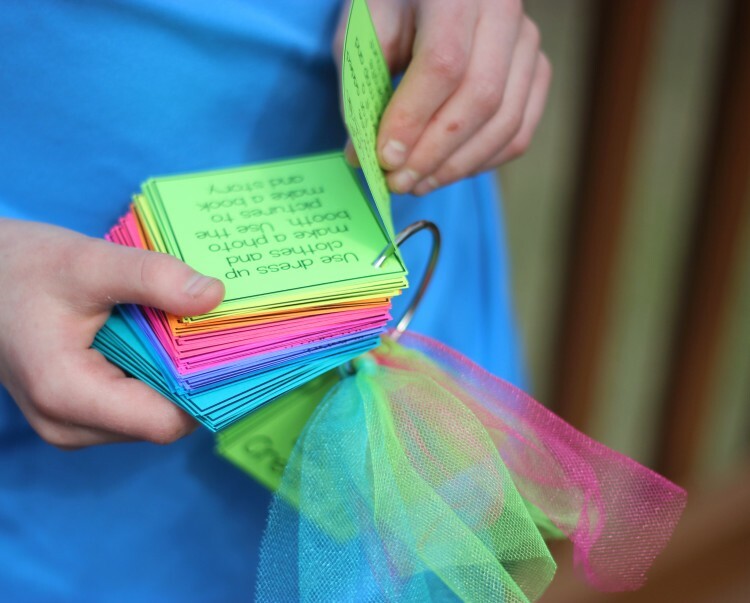 But hey, if you don’t like my ideas, I’ve made this packet with an EDITABLE feature to add your own ideas. Creating the rings is super simple. 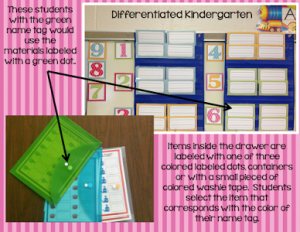 It’s so simple that your students can help you put them together. I mean, they are from them to their parents after all. So all you need to do is click the button at the very bottom of this post to download the file. Once the item is downloaded, open it up using Adobe Reader. Now here is a bit of a side note . . . if you are interested in using the editable feature, you will need to first go and download a free font on Teachers Pay Teachers, Primary Penmanship from Kimberly Geswein. Once you have downloaded and installed this font on your computer, simply restart your computer and the font will be ready to use in the editable portion. Because there are so many categories of activities, I wanted them to be easily organized. So, of course, I grabbed my favorite Astrobrights colored cardstock and printed each category on a different color. You can chose which ever colors work best for you. 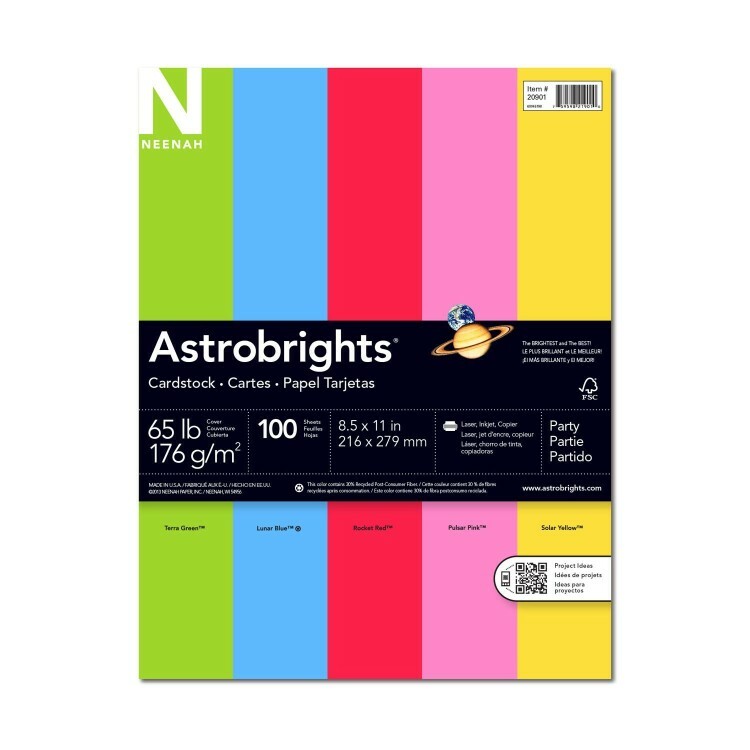 The great thing about Astrobrights papers is that there are so many from which to chose. Here are my favorites and how I paired them up. 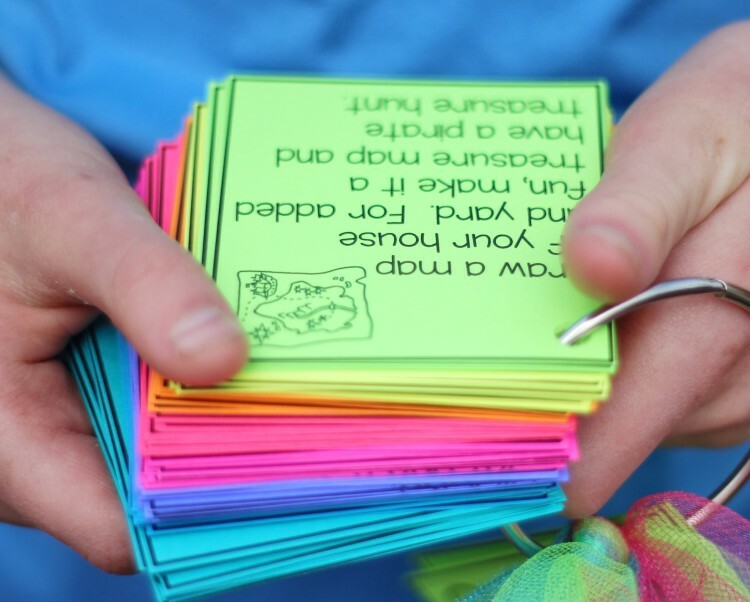 Once your sheets are printed, simply cut them apart and hole punch the corner of each card. Cutting and hole punching . 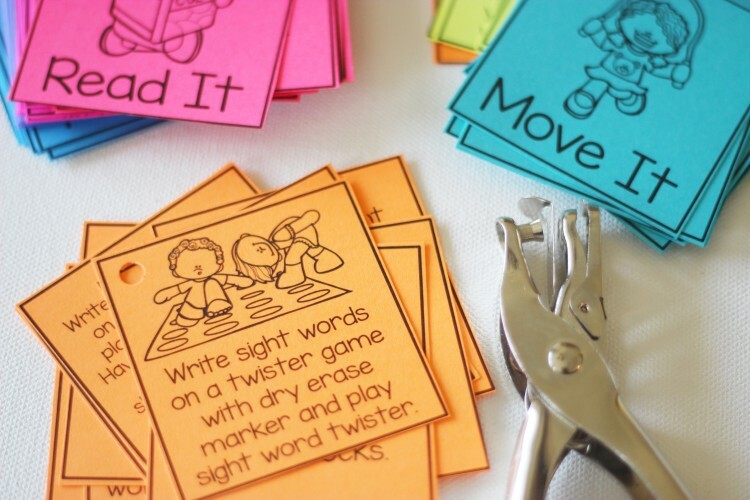 . . definitely two activities your students can do. Don’t freak out if their results are not ‘perfect.’ Remember, it’s a gift from them to their parents. 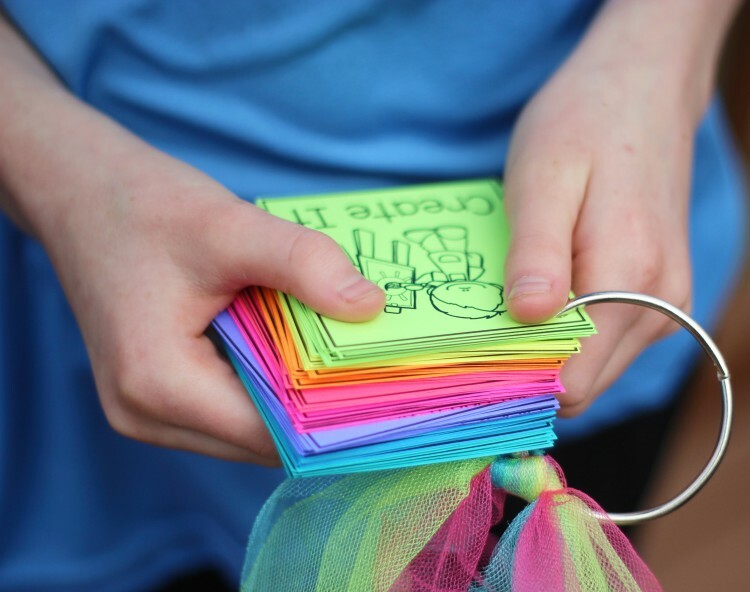 Once cards are cut and punched, sort them by color and place them onto a metal ‘book ring‘. Just for a bit of added flare, you can add a little colorful chiffon ribbon. I always suggest that parents find a central location for their ring so it’s always readily available. Our own ring is on a simple command hook that’s next to our family calendar. But let’s face it, with this gorgeous Astrobrights colors, it will be hard to misplace these cards. 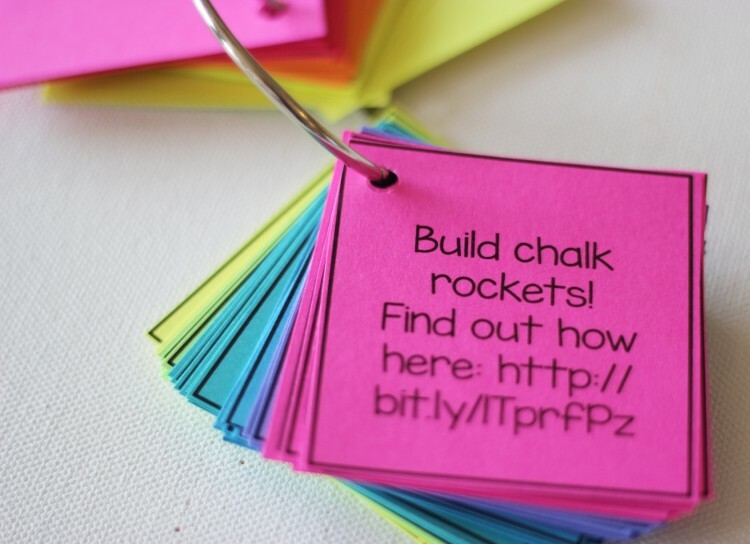 Your students will have fun, educational activities at their finger tips all summer long. 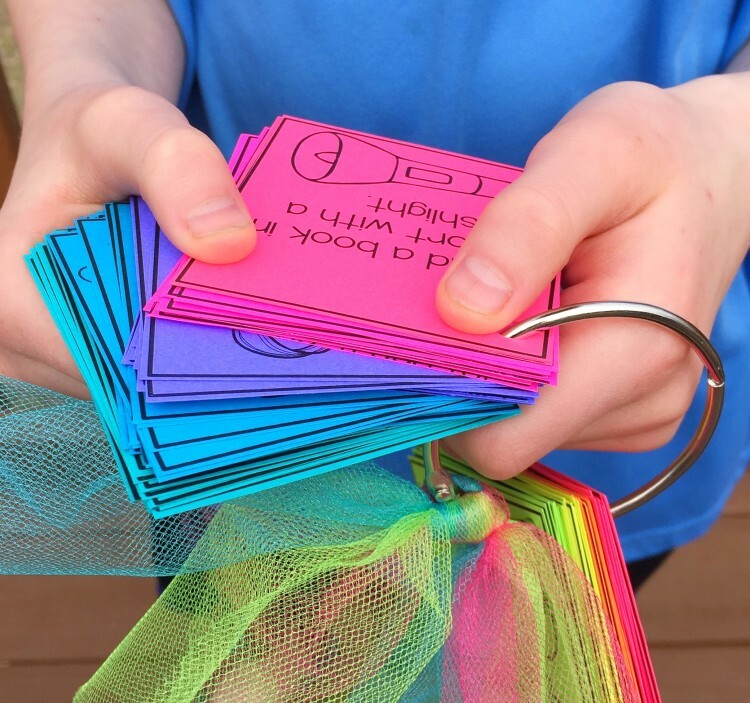 Astrobrights makes them look so fun and engaging, you’re students will be begging their parents for a chance to get their hands on some summer fun! So how can you get your own copy of this great little summer boredom buster? Just click on the button below. You will enter your email address and an email will be sent to your inbox. Now sometimes mail systems don’t like to get this kind of mail so they send it to your SPAM file. So if you don’t see it, check there. Once you confirm your subscription to my mailing list, the file is downloaded right to your computer. You can check your ‘download’ file and you should find it there. You are totally AWESOME and absolutely the BEST ever!!! I LOVE your creativity and generosity!!! My parents will LOVE this!! THANK YOU!!! Thanks so much Maribeth. So glad you like it. I clicked the area to download the file and it just opens a small window to add my email address and then nothing. Help! The file has been sent to your email address. You just need to go open it. Please make sure it didn’t end up in your SPAM file. It does sometimes get filtered there. HI I clicked the button to get my freebie. Then I had to put in my email and all I got was a THANK YOU! Thank you for what? Where is the freebie? I feel like I got spamed. No you did not get SPAMed. The freebie has been mailed to you. You may want to check your SPAM file though because it does sometimes get filtered in there. This looks really great, but it’s not downloading for me. I get to the page with my email and I push the button and nothing happens. Is there any other way that I could get this? My parents would love it for the summer! You will receive it as an email. I am always amazed by your creativity and find myself very often purchasing your products and reading your blog. You are such an inspiration! I wanted to download the summer boredom busters, and signed up with my email..However, it sent me the punch cards instead. Could you direct me to where I can access the summer cards too? Make sure you check your SPAM file. It sometimes ends up there. This is wonderful. Unfortunately for my this-year’s students, I am behind on the blogs I follow and just discovered this. I will certainly use it next year (and may sneak in to school to print it this summer so I have time to get it ready). BTW, I had no trouble receiving, finding, or printing it. THANK YOU!! These are fantastic! I, too, discovered this a little too late for this year’s bunch, but I will be sure to prepare this for my next bunch of Kindergarteners that come through. You are amazing- thanks again!! You need to use the sign up form. Once you confirm your subscription, the document downloads to your computer. Check your ‘download’ file and I’m sure you’ll find it there.